So today is polka dot day! I'm pretty late in the day posting this, but only because I didn't want to take off my gradient pattern. Whilst I'm enjoying this challenge, it's irking me that I can't wear the mani longer than a day - especially after putting time into it. Okay, so no-one is threatening me with a flogging if I don't change my polish everyday, but I don't want to let the challenge drag (I'm actually looking forward to letting my nails rest for a bit). Anyway, here are my nails. The Face Shop nail polish with Sally Hansen's Golden Cinnabar dots, topped with Wet 'n' Wild's Tipsy. I'm sorry, I couldn't help but pose a little with my new toy. I had my old 3GS for two years so I'm pretty impressed with the latest iPhone technology *cheesy grin*. See you tomorrow with 'stripes'! I LOVE this manicure. It's gorgeous! 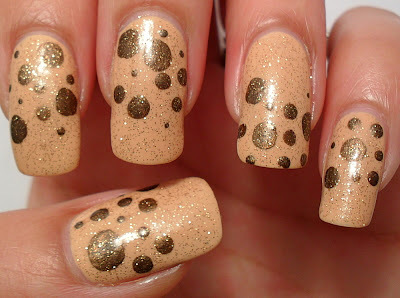 Amazing blog and i love your nail art..